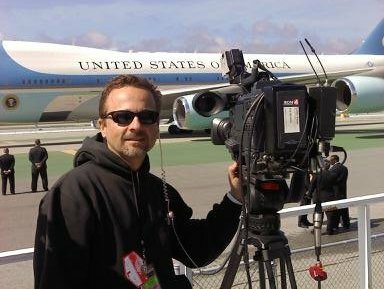 A television news reporter with San Francisco station KRON-TV (Channel 4) was robbed at gunpoint while on assignment in the city, the San Francisco Chronicle reported on Tuesday. Videojournalist Jackie Sissel was preparing to file a report for the TV station early Tuesday morning near a freeway overpass in San Francisco when he was approached by two men with bandanas covering their faces. Sissel was ordered at gunpoint to move to the back of his news van. The men stole a camera tripod, a laptop computer and a wallet before fleeing, the newspaper reported. It is unclear if Sissel was injured in the incident. No arrests have been made. Station management declined to comment when questioned by a Chronicle reporter on Tuesday. The incident came nearly one year after a KRON news crew was involved in a shootout between would-be thieves and a security guard that had been hired to shadow the crew in the city. Other stations have hired bodyguards for their news crews after falling victim to similar attacks in recent years. Correction: An earlier version of this story said the KRON journalist had been robbed at gunpoint in Oakland. He was reportedly robbed in San Francisco. In addition, the story said a KRON news crew was caught in the middle of a gun battle last year in Oakland; that was also in San Francisco. Oakland and San Francisco are two different cities. The Desk is currently accepting financial contributions for the purchase of a map.